We get a lot of Digg-style sites in our submissions at TechCrunch, most of them are alike and don’t get covered. 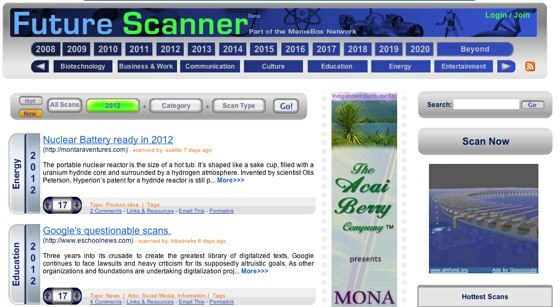 Future Scanner wont win any awards for its looks but like any interesting and/ or good site its the content that ultimately counts. The content listed on Future Scanner is surprisingly broad; whilst many would automatically think gadgets would dominate a site like this, there were articles on urban planning, culture and entertainment among others. This site won’t appeal to everyone, but those with an interest in the world of tomorrow may find enjoyment in the service that Future Scanner provides.